CAUTION: There is also an IMPORT function for importing data from a CSV file into your EEPROM. Do not use this feature unless you are 100% certain that the data you are importing is compatible with your radio or explicitly instructed to do so by the FlexRadio Development Team. Importing invalid data could possibly lead to EEPROM data corruption that can only be remedied by sending in your radio to the Service and Repair Department for repair. Correcting this problem would not normally be covered under warranty repair. CAVEAT UTILITOR! Then click on the READ button to query the EEPROM data. If your computer is not properly communicating with the SDR hardware, then an error screen will be displayed like the one shown below. Then click on the EXPORT button to query the EEPROM data. The button will turn RED and the application will loose focus (grayed out) while the EEPROM data is being read and the CSV (comma separated values) file for 45-60 seconds. When complete the EXPORT button will revert back to the original color and the program will come back into focus. Once completed, there will be a CSV file in the folder from which you ran the program. It will have a file name like xxxx-xxxx.csv where xxxx-xxxx is the radio's serial number. The file will have a series of hexadecimal values written out. 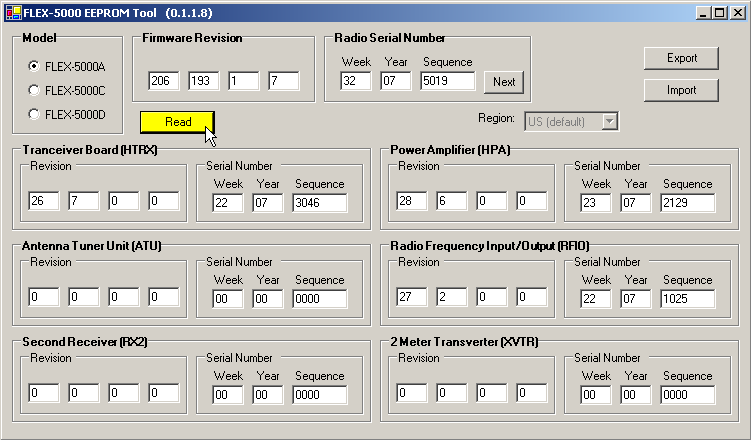 This file can be used by FlexRadio Software Development Team to diagnose possible EEPROM data integrity issues. Article has been viewed 18,879 times. Execution: 4.938. 19 queries. Compression Disabled.